Despite being very rich in history Poland is still very affordable, enjoy brilliant budget breaks in the cities of Kraków and Warsaw or indulge in the welcoming and stunning countryside beyond the urban areas. You’ll also find breathtaking mountains and lovely beaches to enjoy your time in Poland. November to February are the coldest months, with May through to late September being the high season so when you go make sure its when the beauty of Poland can truly be emphasized. What plug sockets are used in Poland? In Poland the plug sockets used are type C / E, the following pictures show the outlets and plugs needed. 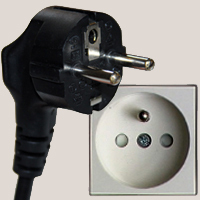 When traveling from the UK you will need an adapter for types C / E.
What voltage & frequency is used in Poland? In Poland, the standard voltage is 230 V and the frequency is 50 Hz. This means you will be able to use all of your normal appliances in Poland as the voltage is exactly the same as in the UK, making your journey much easier. On this note, it is important to make sure you do check your appliances to confirm this is the case. Many appliances can be used across the world as they include a converter, this will be noted on the label showing ‘INPUT 100-240V, 50/60Hz’ meaning it can be used anywhere in the world. Most products such as laptop chargers, tablet chargers, cameras, phones, and toothbrushes are included in this category, but please do a double check.